Etching is a form of intaglio printmaking. Acid is used to bite into unmasked areas of a metal plate. Ink is then pushed into the crevices and then the inked plate is placed on paper and put through a printing press. The pressure pushes the ink on to the paper. 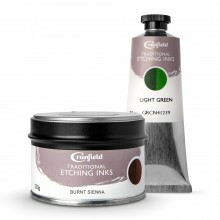 In this section you will find a selection of inks suitable for etching.